Grass Pollen Allergy is the development of an allergic reaction to grass pollens. It can occur within a few minutes of exposure to the airborne allergen. What are the Causes of Grass Pollen Allergy? Some individuals are allergic to grass on contact and may develop skin symptoms including rashes and weals. What are the Signs and Symptoms of Grass Pollen Allergy? In some individuals, who are allergic to grass, a direct contact with grass can lead to symptoms including itching, redness, hives (red weals on skin), and eczema formation. How is First Aid administered for Grass Pollen Allergy? In case of hospitalization, the affected individual may be provided with breathing support and suitable medications to address the symptoms. 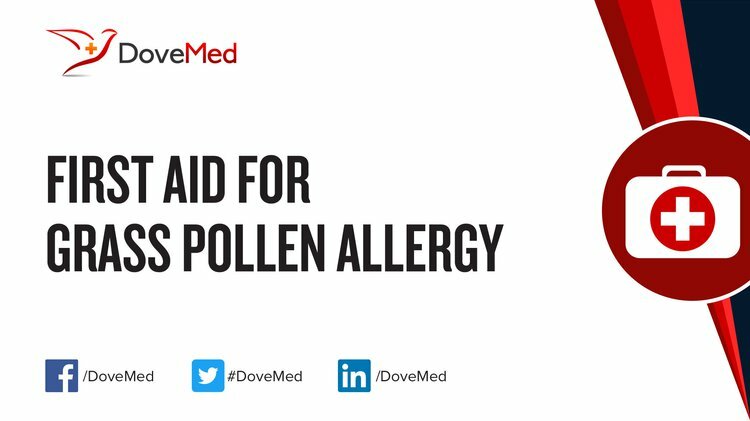 Who should administer First Aid for Grass Pollen Allergy? What is the Prognosis of Grass Pollen Allergy? How can Grass Pollen Allergy be Prevented? Katelaris, C. H. (2010). Food allergy and oral allergy or pollen-food syndrome. Current opinion in allergy and clinical immunology, 10(3), 246-251. Kopac, P., Rudin, M., Gentinetta, T., Gerber, R., Pichler, C., Hausmann, O., ... & Pichler, W. J. (2012). Continuous apple consumption induces oral tolerance in birch‐pollen‐associated apple allergy. Allergy, 67(2), 280-285. Nelson, H. S., Nolte, H., Creticos, P., Maloney, J., Wu, J., & Bernstein, D. I. (2011). Efficacy and safety of timothy grass allergy immunotherapy tablet treatment in North American adults. Journal of Allergy and Clinical Immunology, 127(1), 72-80. Kitz, R., Rose, M. A., Schubert, R., Beermann, C., Kaufmann, A., Böhles, H. J., ... & Zielen, S. (2010). Omega-3 polyunsaturated fatty acids and bronchial inflammation in grass pollen allergy after allergen challenge. Respiratory medicine, 104(12), 1793-1798. Sastre, J., Landivar, M. E., Ruiz‐García, M., Andregnette‐Rosigno, M. V., & Mahillo, I. (2012). How molecular diagnosis can change allergen‐specific immunotherapy prescription in a complex pollen area. Allergy, 67(5), 709-711. Valenta, R., Niespodziana, K., Focke-Tejkl, M., Marth, K., Huber, H., Neubauer, A., & Niederberger, V. (2011). Recombinant allergens: what does the future hold?. Journal of Allergy and Clinical Immunology, 127(4), 860-864. Greiner, A. N., Hellings, P. W., Rotiroti, G., & Scadding, G. K. (2012). Allergic rhinitis. The Lancet, 378(9809), 2112-2122. Maloney, J., Bernstein, D. I., Nelson, H., Creticos, P., Hébert, J., Noonan, M., ... & Nolte, H. (2014). Efficacy and safety of grass sublingual immunotherapy tablet, MK-7243: a large randomized controlled trial. Annals of Allergy, Asthma & Immunology, 112(2), 146-153.